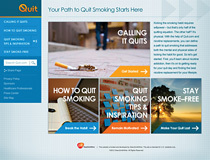 GlaxoSmithKline will launch the Quit.com website, which was built to help smokers at different points in the quitting process. Objective: GlaxoSmithKline will launch the Quit.com website, which was built to help smokers at different points in the quitting process. The site will offer a range of resources for the various stages of quitting, from initial preparations to former smokers who want to stay nonsmokers. Idea: Smoking cessation is part of GSK's mission of helping people live better and longer, says Deborah Bolding, external communications manager with GSK consumer healthcare. “It is a very tough habit to break. We spend a lot of time in this category talking to consumers and understanding what helps them, what they go through, and what they experience,” she adds. According to GSK research, the average smoker will attempt to quit nine times before he or she is successful. “Every smoker is different,” explains Bolding. “In order to be successful, these people are going to have to put together a plan that will support them. We have broken down the website to these areas.” Quit.com is one of several initiatives in the company's Pledge to Quit program. Tools: GSK will send press releases to targeted media outlets and an email blast to a database of smokers who have opted to participate. The company will also reach out to health and wellness bloggers, as well as bloggers who identify themselves as smokers. GSK has also done research across integrated channels with digital and social agencies into the types of search engine queries smokers type into their browsers to understand what information they are seeking to direct them to Quit.com as a comprehensive resource. Measurement: GSK will gauge success by looking at the traffic to the site, click-through rate, and overall impressions. The company will also look at specific indicators, such as how much time is spent on the site and what sections seem to be the most appealing to users so GSK can see where there may be opportunities for more content or options for current or future users.